After Nighthawk dies, his friend and Nurse Luann Bloom suspects the Defenders were involved in his death. She follows a lead but meets the Elf instead, they go on to meet cosmic entities. Luann is revealed as a robotic 'Time Buoy', which she later denies. 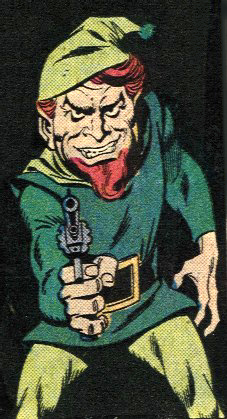 An Elf was also the one to reveal to the original Defenders – the Hulk, the Silver Surfer, Doctor Strange, and Namor – that they would be the cause of the Earth's destruction if they continued to work together. Thus, the four agreed to never work together again as the Defenders and quit the original team. This claim is later revealed to have been a hoax. Another elf shows up, claiming to be Relf, the nephew of the original Elf, named Melf. Even more on ELF WITH A GUN can be found here.